As we’ve mentioned before, dog are natural pack animals. So, as in any group, human or animal, situations, leaders and followers emerge. Leaders are the ones that take charge, of both the situation and any resources for the group. Also, just like with humans, when more than one tries to take charge, fights are likely to break out. Unfortunately, with animals, the fights are going to be more than just screaming, or arguments. They are most likely to get physical, really fast. So when a one pack member attempts to take control, by dominance aggression, any other animal who perceives himself to be the leader will attempt to regain control, also by dominance aggression. Dogs don’t understand equality. They are social animals that have retained many aspects of their ancestors (wolves) hierarchical or pack mentality. They want a defined leader, and hierarchical structure. In a large dog pack, with no human involvement, they will figure out the order of the pack themselves through submissive and dominant signals. Problems arise with social or dominance aggression when one member challenges a higher ranking member. Or when the leader believes he’s losing control. Social or dominance aggression in dogs most often occurs in un-neutered males, and dogs between the ages of 1 -3 when they reach social maturity, but isn’t exclusive to them. It can happen with dominant females, spayed or un-spayed, and dogs of any ages. Dogs can also try to dominant their humans, through social or dominance aggression. And this is definitely not a good thing for any dog owner. When humans are involved with dogs, they, meaning all humans in the house – even the little ones, must be the leader the dogs need. Or they may find their dogs challenging them for leadership. Teaching your dogs the 10 basic dog commands will help establish you as the leader of your dog, or dogs. And using the “Nothing in Life is Free (NILIF)” dog training program is a great way to constantly, and consistently remind your dogs that you are the leader. And that you control all of the resources. Rarely do dogs, that are well trained, and “working” for everything they get, challenge their owners. They know who is in charge, and they remember it well. Spaying and neutering helps with their aggression, of all kinds. Not to mention all kinds of health problems. Punishment based, rarely works when it comes to dog training, especially with dominance aggression. You’re more likely to promote an escalation of the aggression instead of losing it. Also keep in mind, that a well exercised, and well socialized dog is easier to train and better behaved. A lot of behavior problems with dogs stem from lack of socialization and exercise. 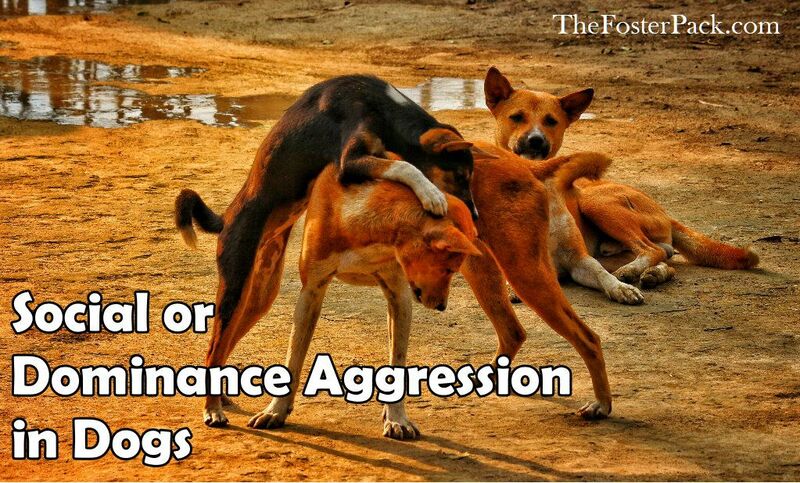 Social or Dominance Aggression with other Dogs. Even well trained dogs, though, can have social or dominance aggression with other dogs. Especially in multi-dog households, where their interactions are not constantly monitored. And anyone who has ever lived in a multiple dog home, knows that you can’t always supervise every dog, every moment of the day. Most of dog on dog dominance aggression, like most other behavior problems, stems from lack of socialization and training. But it’s often hard to socialize an aggressive dog. So start with the training. Training, such as mentioned above, the 10 basic dog commands, and starting with the NILIF training program, with all dogs in the household, will help with their dog on dog dominance aggression, somewhat. It establishes you as the leader, for all of the dogs. And when done right, teaches your dog to trust you completely. But it won’t always end all of the pecking order fights, or dominant mounting. Once your dominant aggressive dog(s) have had their basic training, and have been living the NILIF life for a while. Start working on socialization. Slowly, and always in full control of the dog, using desensitization and counter-conditioning. Take note of the situations that cause dominance aggression to break out, and start one aspect of it at a time. We humans don’t always get along, and can’t always be forced to get along. Just like us, sometimes, due to no real fault of the owner, two dogs may just not get along. And they can’t be forced to get along well either. So it comes down to managing the aggression, or re-homing one of the dogs. We have two, that don’t get along. Santana hates Woobie, with a passion. We manage it by having the separate packs. Separate play times, and separate sections of the house. These two dogs never are in the same vicinity of each other. It works for us. It also keeps a manageable number of dogs in each pack. And allows us to decide where each new foster should be placed in the household, by age and behavior. But then few households have the number of dogs that reside here at any given moment. My dog Lexi has social dominance issues. Well I guess you could call it that. She guards me and her toys from my male GSD Zè. It’s been a tough road but it’s getting better. It’s kind of hard to work with it because it happens at every turn. He’s cool about it though because he’s super chilled. And when I’m not around they play and love each other so much. I watch them through the kitchen window and see how amazing they are together. And the weird thing is if I try to separate them, he’ll hang around and wait for her and vis versa. They are inseparable. Our dogs sometimes do that too, guarding me from the other dogs. As long as they get along with each other any other times, the guarding can usually be managed. It’s amazing how attached dogs get to each other. The only bad part is, it’s so much harder on them when their best canine friend crosses rainbow bridge. I don’t think our Jackyl has ever recovered from losing his little buddy, and it’s been almost 4 yrs. I think the whole situation bothers me more than it bothers either of them. And Lexi came from a past where she had to fend for herself to get food, water and shelter so her behavior makes total sense from her perspective. Thankfully the guarding interaction never turns into conflict.